NLP Modeling is the process of recreating, replicating excellence. Installing it in individuals, groups and organisations. We can model any human behaviour by mastering the beliefs, the physiology and the specific thought processes (that is the strategies) that underlie the skill or behaviour. It is about achieving an outcome by studying how someone else goes about it. The test for modelling success is – Show them how to do it. Can they do it? This modelling process is the basis for our NLP Training Courses, you can get full instruction via our NLP online training e-Learning section of this website. 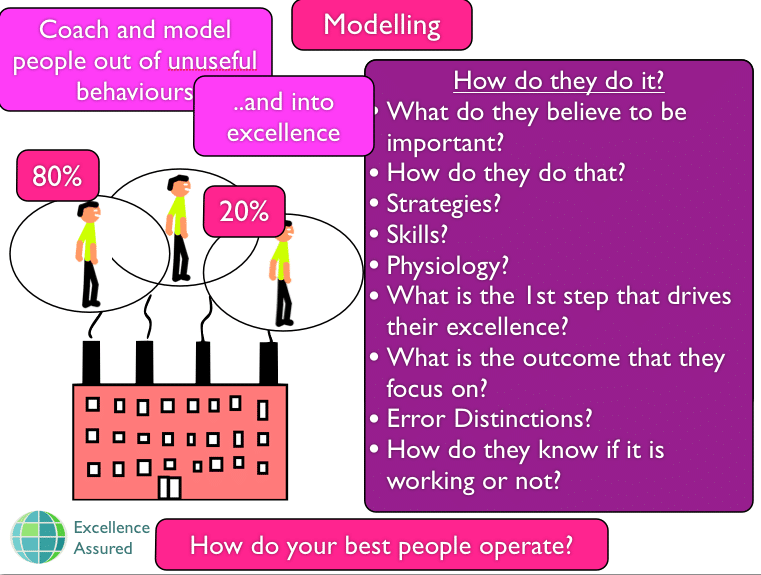 Determine the human experts to be modelled and the contexts in which they apply the capability to be modelled. Set up and carry out the appropriate information gathering procedure in the appropriate contexts from different perceptual positions. Start with intuitions at 2nd position, then reproduce from 1st position. Take 3rd position to notice any differences. Modelling I and Modelling II. Filter the results of the information gathering procedure for relevant cognitive and behavioural patterns. Organise the patterns into a logical, coherent structure or model. Test the effectiveness/usefulness of the model you have constructed by trying it out in various contexts and situations, and making sure you are able to achieve the desired results. Determine the most appropriate instruments to measure the results of the model, and find the limits or the ‘edge’ of the model’s validity. By-products of the modelling process – Understanding something better by developing more meta-cognition’ about the processes which underlie it. Bringing the skill into the awareness. More you model the better you get at modelling. Success strategies that work in other areas of life than what it was originally modelled for. Possible in the world and possible for me is only a matter of how. Experience in the moment is the sum total of everything that you are sensing “outside” and “inside” your body (whether consciously or unconsciously) plus everything that you are thinking (again, consciously or unconsciously). Inside modelling is modelling what is going on inside your awareness, conscious thoughts. Behaviours, physiology. Outside modelling is modelling what is going on outside of your awareness, unconscious thoughts and actions. Values, Metaprogrammes etc. Modelling I – Implicit modelling – 2nd position. Someone watching your gross motor movements and physiology. External Behaviour. Comparing what is essential and what is idiosyncratic (based on the context). Identifying what the top performers are doing that the average ones are not. This results in the construction of a model of effective behaviour and mental processes.